GOLD COAST — A new "co-working" space will open its 13,000-square-foot Gold Coast office to 50 tenants willing to work in view of their neighbors in August. Amenities include free Wi-Fi, printing and copying, 24-hour access to the office's units and common areas, and free coffee and happy hour beer. The free drinks are a testament to the high value Assemble places on networking. 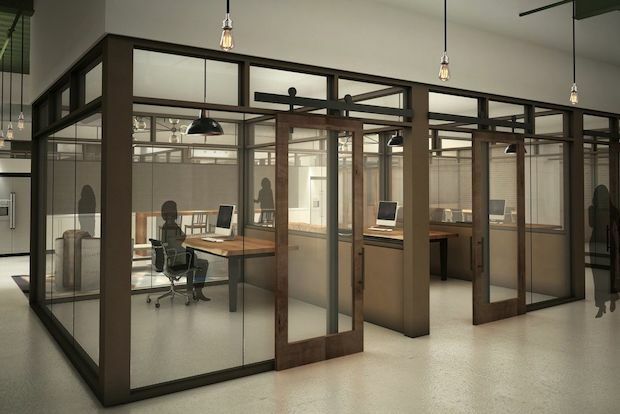 The fishbowl-style office swapped traditional cubicles for wood-framed, glass-walled office and is heavy on the common space, with a meeting room, open central "cafe" and bistro-style tables lining the window of its hallway-turned-"open meeting space." Included in the rental price is access to a monthly networking event at which entrepreneurs are encouraged to mingle and swap ideas. Located inside the complex at 1165 N. Clark St., Assemble is the first high-concept shared office space of its kind in the Gold Coast and neighboring Old Town neighborhoods. "Assemble's founders wanted a full-service, modern-loft building setting with high ceilings and lots of natural light," said building developer Matt Duhig. Duhlig said the team wanted to open in the Gold Coast specifically "for the same reasons it is the hottest residential market in the city: because of what it offers in terms of restaurants, shopping and access to the lakefront. "There is demand for shared office space but not one offering in Old Town or the Gold Coast, Assemble will have a significant first mover’s advantage," he said. Office sizes vary, with some fit for a single worker or small groups. The largest rental office fits 10, and rent for its month-to-month leases starts at $450.